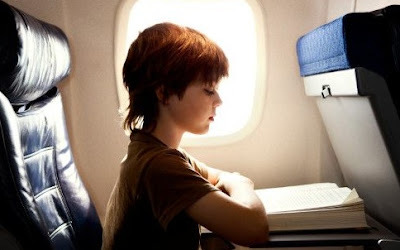 The Guardian Books Blog had a good piece this week on Mile-High Reading. It was about which books to take on a long haul flight. It attracted a lot of suggestions in the comments field and some good advice. Don't take Manga as you need about 20 for a long flight because they are so fast to read. Likewise don't take something too slim (By Grand Cental Station I Sat Down and Wept, Livingston Seagull, Great Gatsby etc.,) or something you have nearly finished. Not a good idea to take something too controversial- like a book on assassination techniques (there are several) or an inciteful youth revolution book such as 'The Coming Insurrection.' Douaniers are a literal lot--a colleague who had a few rare leather bound antiquarian books on Afghanistan that he was taking to a book fair was delayed for hours having to explain their presence to uptight officials. In general you also don't want anything too deep or too unpleasant. For some reason a few people went for erotica (e.g. Anais Nin) and several for books related to their destination. 'Bitter Lemons on the way to Cyprus, 'The Beach' en route to S.E. Asia, Cervantes for the Iberian visitor etc., Other authors recommended include Sir Terry Pratchett, Haruki Murakami, Vikram Seth (the enormous 'A Suitable Boy' at 1471 pages, one for the beach and the return flight) Roberto Bolano's amazing 2666, 'Foucault's Pendulum. There is something to be said for the philosophical thriller -especially as one's main concern is to while away the tedious but anxious hours. In my opinion you don't want utter rubbish - after all this might be the last thing you ever read. I was once absorbed on a mid length flight by de Botton's 'How Proust Can Save Your Life' --less demanding than 'Temps Perdu' but useful and edifying. Anything by A de B might be suitable or any other purveyor of 'philosophy lite'--you usually see someone reading Deepak Chopra. Scando thrillers were much mentioned and they can currently be useful for absorbing the hours--thank God for Wallander and Kalle Blomkwist. Cormac McCarthy was cited as a real bringdown for the flying reader, likewise you might avoid Sir Thomas Browne's 'Urne-Burial' , although Burton's Anatomy of Melancholy could be absorbing. Several people mentioned that books you could dip into were a good idea - Perec's 'Life a Users Manual', Browne's follower W.G. Sebald, Ackroyd's 'London' etc., Audio books were also advised although I tend to associate them with motoring and commuting. DVD's can now be watched on Iphones for those not happy with in-flight movies and Sudoku and puzzles sometimes do the trick. I once sat next to a guy who attached his laptop to the window and monitored the land beneath via Sat Nav-- he seemed content with that. 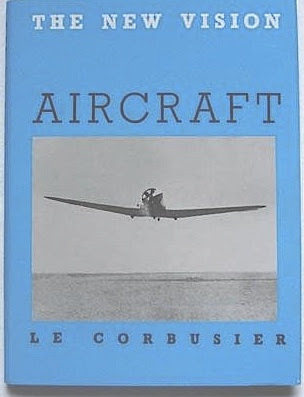 The book shown by Le Corbusier 'Aircraft' is a classic modernist photobook from 1935 published in England and not that scarce (sans jacket) but you can usually get £200 for a sharp copy. Parr either ignores it or doesn't know it. Lastly, the last time I flew to USA (October2009) I was surprised by the amount of people reading- there were more readers than laptop users and even a couple of Kindle like devices. All is not lost. Likewise, on a rare visit to London (for the O2 tennis) a month or so ago, I was heartened to see how many people were reading books on the tube, even when squashed up like sardines in the rush hour. I also noticed authors like Pratchett & Murakami were popular choices. Your image shows 'Aircraft' WITH jacket, and in very nice shape, too. I would imagine you could get more for that copy. Erotica is recommended for the nervous flyer... it does take one's mind off the turbulence. The English Governess is a good choice. Either the person in your photo is only three feet tall, or she is riding in a class I don't get to sit in much. There's a reason people forgo the laptop -- when the seat in front of you reclines, you can't open the lid far enough to see the screen -- as little as 30 degrees. I have good luck with two categories: hard-boiled crime fiction (Aussie Peter Temple is a current favorite), or one of the new variety of breezily-written John-McPhee-ish microhistories, like "Oysters", "Cod", "Color: A Natural History of the Palette", and so forth. Nothing too academic or heavy. A recent winner on a long flight was "Ghosts of Spain" by Giles Tremlett; also "The Naked Tourist" by Lawrence Osborne. Dude--she (or he) is in business or even first class, having switched her credit card to 2 miles for a dollar. Through persistent shopping she can upgrade every flight (or quite often.) Mind you with a good Peter Temple or even Simon Templar it doesn't matter even if you are sitting behind a basketball star.